At Villa Floramare, you’ll wake up to the sun, sea and the right kind of blues! Stylish and chic, with bright airy living spaces and a well-landscaped compound, Villa Floramare was made for the vacationer who appreciates style and comfort. The show stealer here is the incredible view, featuring the rugged coastlines of Koh Phangan, Koh Tao and Angthong Marine Park, as well as vistas of the ocean and dramatic sunsets - all of which are enjoyed from an excellent vantage point, thanks to Villa Floramare’s prime hilltop setting. Containing four bedrooms, Villa Floramare houses eight guests in total. Large travelling parties have the option of renting the neighbouring Villa Alina to accommodate up to 16 guests. Each of the four bedrooms are decorated to facilitate a night of uninterrupted rest, and comes fitted with air conditioners, en suite bathrooms, wardrobes, quality linen, accent chairs and handcrafted wood ornaments from Chiang Mai. Of the two master bedrooms, one extends out to include a balcony with views out to Villa Floramare’s postcard-perfect surroundings. Both guest bedrooms feature private en suites and ample storage space; one comes fitted with a double bed, while the other features twin singles and views out to the ocean. A glistening infinity pool takes centerstage at the outdoor compound of Villa Floramare. A spacious pool terrace, paved with non-slip tiles frames the pool, and is bedecked with four sun recliners. To the side of the pool lies a jacuzzi, a favourite hangout where guests gather for a soak while enjoying cocktails and bubbly. 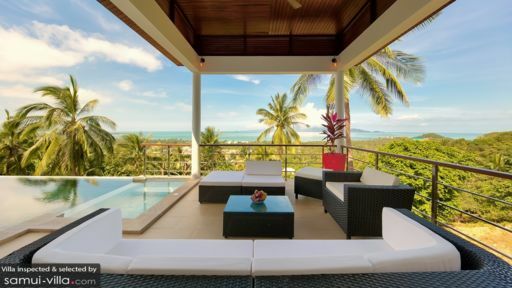 When you’re done with taking a dip, rinse it all off in the outdoor rain shower, before lounging comfortably at a poolside sala outfitted with rattan couches to take in the surrounding scenery and warm Samui breezes. The well-appointed living spaces at Villa Floramare oozes style and cosiness. You’ll feel right at home in the open plan common area, where sunlight streams in through the glass sliding doors to create a bright, airy interior. Sink into the turquoise couch strewn with throw cushions for a nap or a movie on the flatscreen TV, and tuck into delicious homemade meals at the eight seater dining set. The open kitchen is chic and minimalist, with kitchen fixtures and furnishings in monochromatic hues of white, black and gray. Not in the mood for culinary endeavours? Leave all the cooking to your personal chef! Housekeeping services, security services and airport transfers are included with your stay. A baby cot and high chair are available for use free of charge. Amenities available at additional cost include personal chef services and a daily breakfast service. 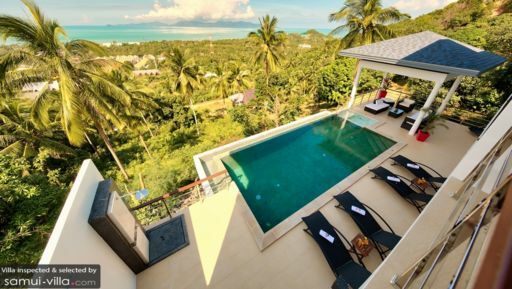 Villa Floramare is located in Mae Nam, in the northwestern region of Samui. 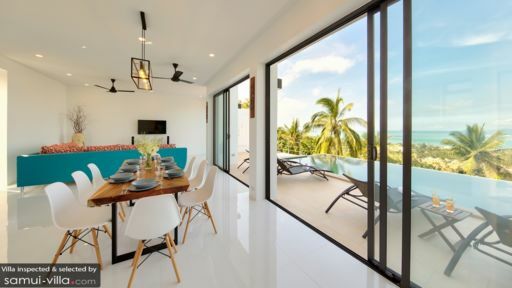 Popular travel attractions in the vicinity include the Mae Nam night market (a six-minute drive), Mae Nam Beach (a 10-minute drive) and Mae Nam Chinese Temple (a six-minute drive). The renowned Big Buddha, with its glittering golden statue is a 17-minute ride from your villa. Bophut Beach, as well as the charming Fisherman’s Village is located a seven-minute drive away. The latter, a popular hangout for expatriates and travellers alike offers plentiful options for dining, shopping and drinking.